This is the Blackburn coat of arms. The dove at the top represents peace and was also a symbol used in the Feilden family coat of arms. The shuttle is there to represent weaving, cotton being the principal product in 'old' Blackburn. The bees represent industry. The wavy, black line, represents the river Blakewater (black water), which runs through the town. I seem to recall reading somewhere, that the bugle horn between the two diamond shaped lozenges, had some connection to the town's first elected mayor, W. H. Hornby ( Horn Bee? ). I'm happy to be corrected, if I'm wrong. The full explanation of the Coat of Arms courtesy of Cotton Town. It's a bit long winded I know, but Colin you are more or less correct with your shortened version. 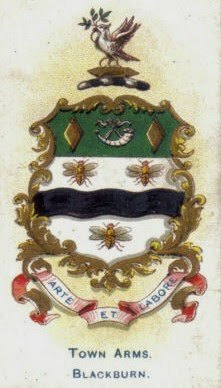 The Coat of Arms comprises: Three bees in flight. The bee is an emblem of skill, perseverance and industry. “B” also stands for Blackburn; and further, as the Peel family sprang from this neighbourhood and bears a bee in flight on its shield, the idea naturally suggests itself that Sir Robert Peel had adopted the Blackburn bee. The shield is silver or white, and thus emblematical of calico, the product of the Blackburn bees. The broad wavy black line represents the Black Brook (Blakewater) on the banks of which the town is built. The silver bugle horn was the crest of the first Mayor of Blackburn, William Henry Hornby, Esq. It is also the emblem of strength. The gold lozenges, or fusils (diamond shaped), are the heraldic emblems of spinning, derived from the Latin “fusus” or “fusilium,” meaning a spindle, and they refer to the invention of the “Spinning Jenny” in 1864 by James Hargreaves, a native of the district. They also denote the connection of Joseph Feilden, Esq., with Blackburn, as Lord of the Manor, as he bore lozenges on his shield. The background of green is there to remind us of the time when Blackburn was one of the Royal Forests in the time of Edward the Confessor. The shuttle is the emblem of weaving, the trade which has contributed more than any other to the prosperity of the town. The dove taking wing with an olive branch in her beak (the emblem of peace) attached to the thread of the shuttle, represents the beneficial results emanating from the art of weaving. I have a framed image of the coat of arms, with a 5 paragraph explanation (even more long winded than Cottontown's) of what each element supposedly represents, from when it was enrolled in the Herald's College, Feb 7th 1852. It looks like Cottontown have edited down that version. a)bee dexter = the workpeople of Brookhose and adjoining mills, b) bee sinister = the workpeople of Park Place & Nova Scotia and c)bee at the base = the workpeople of the mills at the bottom of King Street. Like I say in my original caption, there are various interpretations. I don't think any should be read as gospel. Hell Fire I thought the Cotton Town explanation was long, but as the one you have is even longer I think we'll leave this subject well alone Colin. At least this Coat of Arms is a "Proper One" unlike that Pigeon with a worm in it's beak which the Council introduced in the mid 70's and cost thousands of pounds !! I was glad to see the back of it.